Within just a few seconds of cracking open To Know You by Shannon Ethridge and Kathryn Mackel, I was captivated by the lives of Julia and Matt Whittaker. Faced with what no parent should ever have to deal with—the impending death of their only son, The Whittaker’s effort to save their son has them reeling with a myriad of emotions including doubt and anger at God. While trying to save her son’s future, Julia is forced to face her past littered with failed relationships and two daughters given up for adoption. She has to ask the unthinkable of the two women she abandoned so many years ago. The writers done a wonderful job of showcasing the complexities of our lives. Each of our choices have consequences and faith does not exempt us from troubles but serves as a beautiful backdrop to rest our hurts, pains, joys, and sorrows. Readers will have no trouble connecting with these characters as they grapple with forgiveness, honesty, death, loss, hope, adoption, faith, fidelity, trust, and finding oneself. I thoroughly enjoyed this book and devoured it in two days. If I had only one negative to say about the book was that I felt the ending tied together a bit too well for real life. However, I am still intrigued by these characters and would love to see what happens in the next stages of their lives. 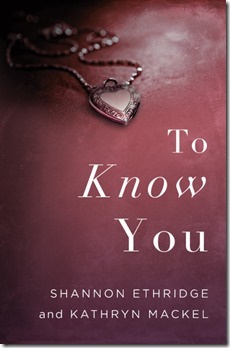 To Know You is a well written book that I would highly recommend! 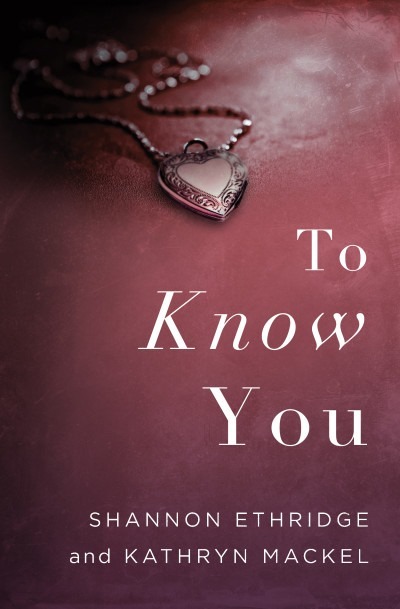 To Know You by Shannon Ethridge Enter today by clicking one of the icons below. But hurry, the giveaway ends on November 19th. Winner will be announced at the “To Know You” Facebook Author Chat Party on the 19th. Connect with Shannon and friends for an encouraging evening of fun chat, book club discussion, giveaways, and a chance to win a PERSONAL COACHING SESSION WITH SHANNON! Don’t miss a moment of the fun; RSVP today by clicking JOIN at the event page. Spread the word — tell your friends about the giveaway and party via FACEBOOK or TWITTER or Pinterest and increase your chances of winning. Hope to see you on 11/19! Disclosure: I was provided a complimentary copy of To Know You through The Litfuse Publicity Group book tour in exchange for an honest review. Views and opinions expressed are my own. “faith does not exempt us from troubles.” Now, this is a daily struggle. It is hard to get to that place where we can be content with the truth that faith does not mean ease. That God that He increases our faith and gives us more grace. If He did not, there is no way I could function. Isn’t that the truth LaVonne. I think that is why there are so many disillusioned people because they have been led to believe that accepting Christ meant a trouble-free life. And that is contrary to what the Word teaches. Thanks Kim. I thoroughly enjoyed it. Sounds like just the kind of book I would LOVE! Thanks for the recommendation, Wanda! The story certainly pulled me in Pam.